On March 31, 2018, the Turkish Presidential Press Office said that the country will host a trilateral meeting on Syria, gathering leaders from Turkey, Russia, and Iran on April 4, 2018. 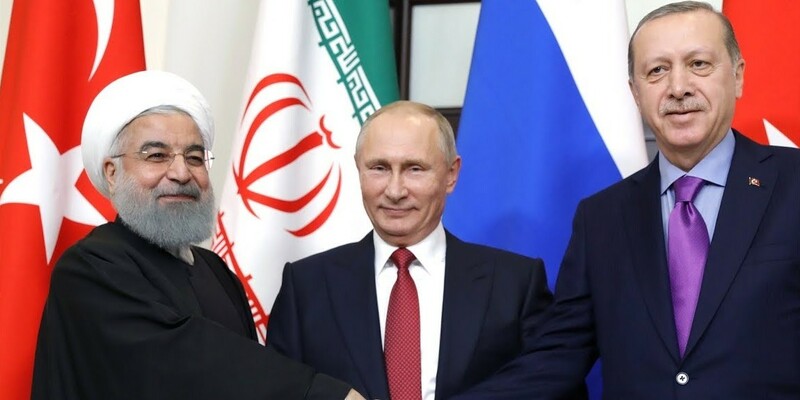 The meeting is going to be hosted by Turkish President Recep Tayyip Erdoğan on April 4, which will be attended by Russian President Vladimir Putin and Iranian President Hassan Rouhani, according to a statement. During the meeting, the leaders will also exchange views on regional and international issues as well as bilateral relations. The first of the trilateral summits was held last year in Russia's Black Sea city Sochi on November 22. In the second trilateral summit that will be held at the presidential complex in Ankara. On the agenda - the recent developments in Afrin following Turkey's operation, the latest situation of the de-escalation zones in Idlib, the political transition period in Syria and the incidents in Eastern Ghouta. A day ahead of the summit, Putin and Erdogan are scheduled to meet in bilateral talks in the Turkish capital as part of the Turkish-Russian High-Level Cooperation Council. Russian Foreign Minister Sergei Lavrov and Turkish counterpart Mevlüt Çavuşoğlu held a telephone conversation on March 30 to discuss the Putin-Erdogan meeting, the Russian foreign ministry said in an official statement. Erupting in 2011, the armed conflict in Syria quickly turned into a full-fledged civil war, which so far has killed more than 330,000 people and displaced millions. The conflict also became a breeding ground for terrorism. The Islamic State once reportedly controlled more than 50 percent of Syrian territory. As part of his visit, the Russian president will also attend the groundbreaking ceremony for the Akkuyu Nuclear Power Plant in the southern province of Mersin on the Mediterranean coast on April 3. The Akkuyu NPP will be built by Russian State Nuclear Energy Agency Rosatom along with its Turkish partners, the Cengiz-Kolin-Kalyon (CKK) consortium. The plant will comprise of four units each with a capacity of 1,200 megawatts. The official launch ceremony took place in April 2015. Major construction was expected to begin in March 2018, and the first unit is expected to become operational in 2023. Despite tensions mounted between Russia and Turkey, due to the Turkish downing of Russian Airplane on November 24 (2015), Russian President Vladimir Putin stated that the decision to continue is purely a commercial one. Turkey's energy imports amount to roughly $55 billion annually and its energy demand is among the fastest-growing in Europe. Ankara aims for at least 10 percent of its power generation to come from nuclear energy in less than a decade to cut dependency on natural gas. Besides that, Turkey also signed a contract with Russia to buy S-400 air defense systems, despite being non-interoperable with the North Atlantic Treaty Organization (NATO), "because the U.S. declines to sell Turkey even pistols," as Erdoğan said. However, there have been reports that Trump may intervene to sell Patriot systems to Turkey in a bid to stave off the S-400 purchase. According to Dilip Hiro, an Indian author, journalist, and commentator who specializes on the politics of South Asia and the Middle East - "On the world stage, the triad of Moscow, Tehran, and Ankara has made its mark by acting as a prime mover to end Syria’s long-running civil war. But their economic interests have been in play for more than two decades and geopolitical considerations have a longer history." Russia, Turkey, and Iran — are working together to create "de-escalation zones" to reduce the fighting in Syria and bring all the sides of the conflict on a negotiation table for the sake of Syria's future. The cooperation comes despite their positions on opposing sides in the Syrian conflict —with Moscow siding with Syrian President Bashar Assad and Turkey supporting his foes since the start of the Syrian war seven years ago. Despite having differences, one should give credit for their collaboration in the "Astana Process", which seems to be a good example of pragmatic, rational and result-oriented mediation efforts for the future of Syria. For Russia, Syria's geography matters. The naval installation in the port city of Tartus, first established in the Cold War, provides Russia's only access to the Mediterranean, crucial for both commercial and military purposes. Iran's support for Syrian regime always included an array of financial aid, arms & weapons, intelligence inputs, and militia on the ground - at the same time, it has also criticized the cruelty of Assad’s regime. More than that, it was Tehran that convinced Russia to enter Syrian conflict, despite their competition for European natural gas markets. On the other hand, Turkey supports for Assad's rebels is all about to build a new sphere of influence in the informal space of the former Ottoman caliphate. In a simple nutshell statement, Syria as a country seems to be an intricate puzzle, one that is hard to view through the prism of American & European sensibilities.